In the years following the publication of Into Thin Air, much has changed on Mount Everest. Among all the books documenting the glorious adventures on mountains around the world, and the unique perils and challenges of Mount Everest, none details how the recent infusion of wealth into the mountains is reacting with the age-old lust for glory to draw crime to the highest places on the planet - how a mountain's ability to reduce climbers to their essential selves is revealing villains as well as heroes, greed as well as selflessness. This audiobook will take listeners on a harrowing tour of the criminal underworld on the slopes and peaks of the world's most majestic mountain. Some of the stories included here are the tragic story of Nils Antezana, a climber who died on Everest after he was abandoned by his guide. Also included is the author's own summit story, as he participated in the Connecticut Everest Expedition, which would never have followed George Dijjmarescu and Lhakpa Sherap to the Himalya had news of the couple's climb with the Romanian team the previous year made it to the United States. But as they neared the frigid peril of Everest, the charming couple turned increasingly hostile. Women on the team held little power and were instead threatened, stalked, and harassed before a final assault. Those that tried to stand against the violence, theft, and intimidation found the worst of the peril they encountered on Everest had followed them home to Connecticut. Beatings, thefts, drugs, prostitution, coercion, threats, and abandonment on the highest slopes of Everest and other mountains have become the rule rather than the exception. Kodas describes many of these experiences and explores the larger issues these stories raise with thriller-like intensity. 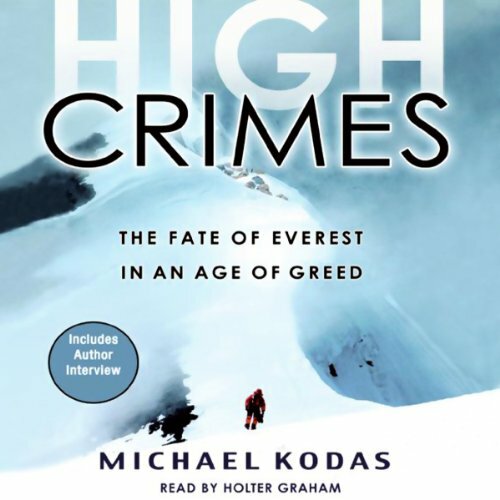 I've rated this book 3 stars because I just find the story of Everest absolutely fascinating and 'High Crimes' adds to this narrative in a way that, while sad, is important and convincing. What detracts from the account is the author's use of himself and his fellows as the unsullied center of this less than noble universe. I dislike it when participants in an event hold themselves aloof from judgement. Krakauer's genuine grief and contemplation of his own imperfection is what makes "Into thin air" so compeling and that introspection is completely lacking in this tale. Journalists may make just as much money from the mountain as guides do after all - what does that do to their own involvement in the mountain's dramas? It would have been a better book had that question been added to the others. First, if you have not read "Into Thin Air", you will be baffled by alot of what is in this book. That being said, I found this story very interesting. It is hard to say how much the abridgement cut into explanations of the mountain and climbing in general. If you found "Into Thin Air" interesting, then you will be fascinated by these stories of climbers struggling to climb Everest and failing, often fatally. The part of the book dealing with the problems in Connecticut after the climb is only small part of the book - the majority of the book is about climbing and Everest itself so don't let the "book jacket" explanation keep you away from this book. Yet another interesting side to the Everest story. I highly recommend this book if you want another point of view about the David Sharpe story, which always intrigued me how 40 people could just walk by this man on their way to the summit while he was dying without so much as a kind word, it is astonishing. I would like to think I wouldn't-do that to a dog. It also told the story of another man left for dead and other high crimes that go on at the mountain unpunished. It is a real eye opener, I especially recommend it to people who want to go climb that mountain. That mountain seems deadly in more ways then one. Suspenseful and excellent narration. I read it all the way through. Also gives you yet another side of the mysterious mountain climbing Sherpas. Meet my expectations although a bit slow at the beginning. Narratios was good and easy to understand. I'll never climb everest unless there are serious changes. I'll be sticking to shishapangma, cho oyu and manaslu for now and maybe dhalugiri and gasherbrum 2 later on down the line.